The Week That Was: March 26th-April 1st, 2009. Jealousy is the only appropriate option. 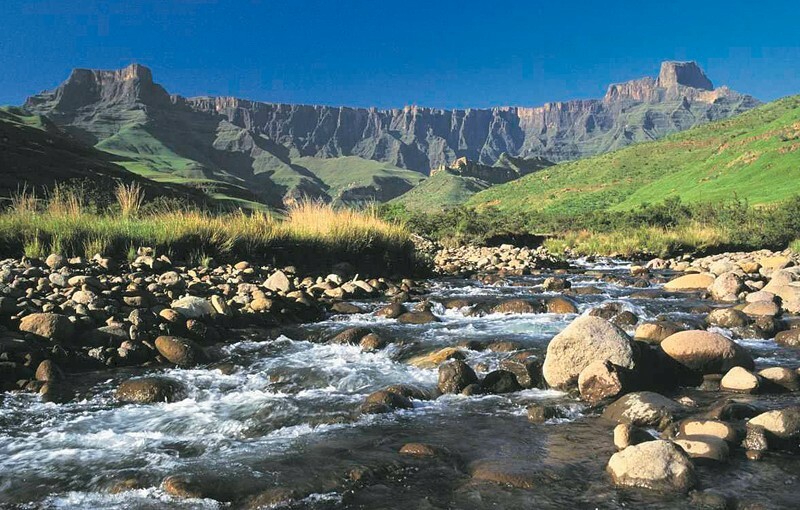 NCSA Men’s Trip to the Drakensberg Mountains, departing in 5 hours! Going to cheat y’all a bit and write this in short-phrase style, as I am up WAY TOO LATE prior to our Men’s Trip, which leaves in 5 hours. Images, video, and actual thoughtful posts coming next week! The Week That Was: Wed and Thurs the Apprentices went to Jo’Burg and stayed at Curtis’ parent’s Guest House, which smelled like fresh paint but was amazingly accomodating and fun! We enjoyed 1/2 price pizza and fine ales at Curtis’ local joint, Jolly Rogers. Then headed to an outdoor lounge area for our first taste of South African jazz. Listened to a funky combo group for about 90 minutes. Thurs had another fantastic David Bosch discussion (Click here for my thoughts) and left deeply challenged about the missional nature of the church. Fri was a blur to me right now–Oh, what am I saying? Colletta Cole and I co-lead our Friday Night Rhythm gathering, and basically provided a means for our entire community to check-in with each other. Then we headed to Lorraine’s for the weekend, and spent 48 hours on a silent retreat that officially ‘ended’ our Listening Posture. I’ll blog on this later, and have some hard things that I wish to share regarding my own journey–but I’m not finished yet! Fall seemed to come this past weekend, and I spent Saturday afternoon laying in the grass watching leaves whisk to the ground all around us. There is a briskness to the morning air which I love! Monday was an exhausted blur which I don’t remember. Tuesday was spent having our community ROCKED by Rob Bell’s Tour DVD entitled ‘The Gods Aren’t Angry.‘ I had a visceral response to his message of grace, in which he repeatedly stated “You don’t have to live this way anymore.” Yes I do! Grace doesn’t mean I actually let go of all my structures and means of saving myself, does it? (Sarcasm alert! )” Still reeling. Finalized plans with Luc and Petunia Kabongo to begin group spiritual direction with 23 NGO health care workers who carry grief and death daily in their medical work. Will begin this after Easter, which I am anticipating greatly. Today was a blur of chores, ‘gyming’ (A verb here! ), and getting ready for our Men’s Excursion. Going to be epic! On My To-Do List This Week: Man Time. Paintballing + Hiking + Settlers of Catan + White Water Rafting + Leaving Pangani = MUCH NEEDED ADVENTURE! Procrastinating About: Going to bed, what else? Books I’m In The Midst Of: Flying through The Shack with thoughts forthcoming. Want to get into Barack Obama’s memoir Dreams of Our Father to see the man behind the myth. Have actually heard he is a pretty good writer! On The Current iTunes Playlist: Been shuffling a lot now. Digging the new Black Eyed Peas single “Boom Boom Pow,” which is the song of the Apprenticeship for us so far. I’m Thinking About: Why don’t I have poor friends? Would having poor friends be simply a societal experiment for me? Am I truly that prejudiced? (Light, I know). Next Trip: See picture above and wipe that drool off your face! How I’m Feeling About This Week: Ready to check out, and hit the road. Need an emotional vacation.